*This blog post contains affiliate links, to make it easier for you to order supplies for growing amaryllis outside. If you click through and make a purchase, I may receive a commission (at no additional cost to you). Have you ever wondered what to do with your amaryllis once the flowers have faded? Instead of throwing it out, you can plant it outdoors, where it will bloom year to year, even if you live in the Desert Southwest. Around the holiday season, amaryllis bulbs can be purchased in most grocery stores, nurseries, or online. I have been enjoying the beautiful blooms of my amaryllis this holiday season and am grateful for the vibrant splash of color on my kitchen windowsill. Soon, the flowers will fade, and I will get it ready to transplant outside. 1. Cut off the faded flower, but keep the stem and leaves, which will continue to produce food for the amaryllis bulb. Don’t worry if the stem oozes sap after cutting, this is normal. Once the stem and leaves turn yellow and die, cut them off. 2. Select an area out in the garden for your amaryllis. They will require an area that gets filtered shade or a few hours of morning sun. It should have fertile garden soil, which can be provided by amending with potting soil. If you have a flower bed or vegetable garden, you can plant the amaryllis in there, OR you can plant it in a container – I love this blue one. 3. Once the danger of freezing temperatures has passed, it’s time to plant. At the bottom of the planting hole, add some bulb fertilizer, following package directions. In desert climates, it’s important to bury the bulb to the top, so that only a 1/2 inch remains above the soil. New leaves will soon emerge that will add a pretty element to the garden. 4. Whenever leafy growth is present, water when the top inch of soil is dry and fertilize monthly using an all-purpose liquid fertilizer at 1/2 the recommended strength. 5. Amaryllis typically bloom in spring when grown outdoors. After the blooms fade, remove them and allow the leaves to remain until they turn yellow and die. At this point, add a layer of mulch, leaving only a 1/2 inch peeking above the soil. Decrease the watering so that soil remains just slightly moist. So, in a nutshell, water and fertilize when they are blooming, or leaves are growing, cut off leaves when they are dead – stop fertilizing and decrease watering. It’s easy to see why amaryllis are a favorite flower when grown indoors and even more so if you plant them outdoors for those of us who live in the Desert Southwest. Have you ever grown an amaryllis outside? *Gardeners Supply provided with this amaryllis free of charge for my review. Like many women, I have not outgrown my teenage love affair with the color pink. However, instead of painting the walls of my room a vibrant shade of pink or wearing a fluorescent t-shirt, I now content myself with using it in the garden. Queen’s wreath vine (Antigonon leptopus) lazily climbs its way up the trunk of my cascalote tree where it sends forth sprays of pink blossoms. I love that its buds are heart-shaped as are the lush green leaves. Although it will die back to the ground in winter, I look forward to it re-emerging in spring as it begins its ascent up the trunk of my tree. *Have you ever grown a queen’s wreath vine? For more information, you can read my earlier post about this pink beauty. Do you yearn to create a beautiful outdoor space that thrives in the challenging low desert climate? Or maybe, you want to inspire others by sharing your experiences gardening in the desert? Whether you are a recent transplant to the desert or an experienced gardener, I’ve created a Facebook group just for you! As many of you have come to find, the low to mid-desert regions of the Southwest (Coachella Valley, Phoenix, Tucson, Las Vegas, among others), that are located in USDA Zones 9-10, are often overlooked in traditional garden literature. This a great opportunity for us to band together and ask questions, provide answers, and share our victories (and failures) to inspire each other toward creating beautiful landscapes that thrive in the low desert. New Gardeners: You will find help and inspiration here – what plants work best, how to maintain, water, and where to plant. Experienced Gardeners: Please share your adventures in low desert gardening, especially your successes! One of the best things about having a garden in the desert southwest is our ability to grow citrus of all kinds. Lemon trees are a popular fruit tree and I am often asked what type of lemon do I recommend. There are different types of lemons but the one that is my favorite isn’t a ‘true’ lemon tree at all. It’s a Meyer lemon, which is a cross between an orange tree and a lemon tree. The result is a fruit that tastes sweeter than your typical lemon and has a lovely thin, smooth skin. Meyer lemons are suitable for use in the same ways that other lemons are, but you can use them in additional ways as well due to their sweeter nature. I recently shared the reasons why you should plant a Meyer lemon tree in one of my latest articles for Houzz. Have you ever grown a Meyer lemon tree? Are Your Roses Feeling The Heat? 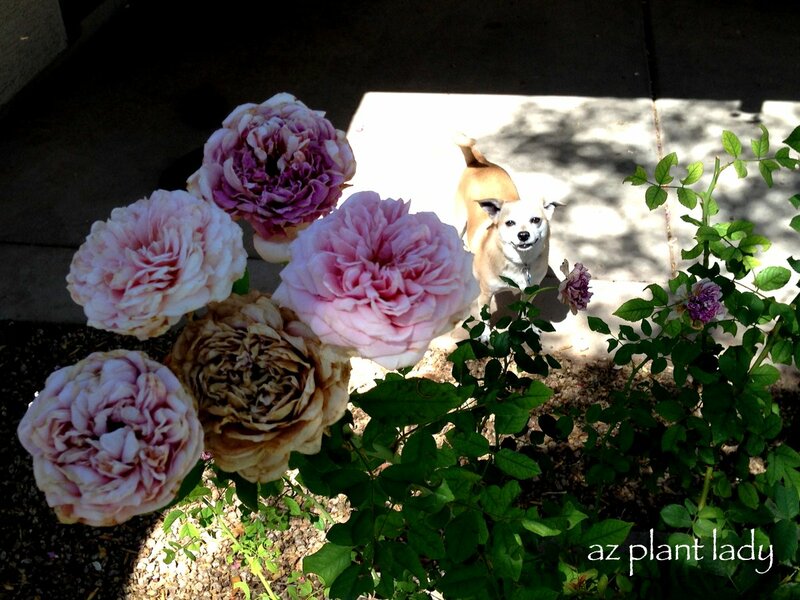 My Abraham Darby shrub rose and my little dog, Tobey. 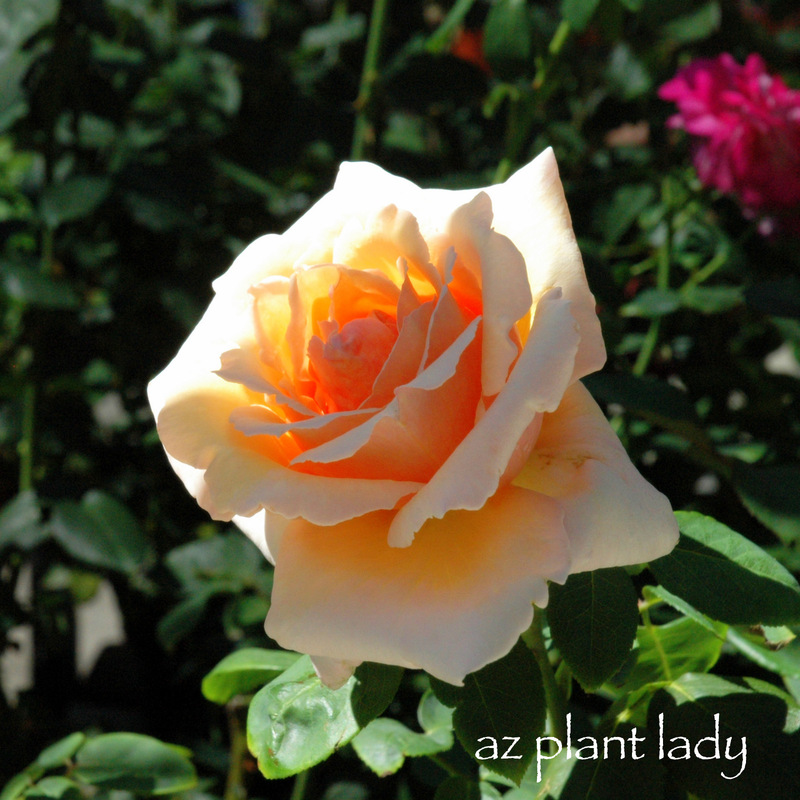 If you live in a hot arid climate like me, chances are that your roses are feeling the heat and aren’t looking their best right now. While gardeners in cooler climates celebrate summer with beautiful rose blooms, the opposite is true for those of us who live in the desert. Roses actually grow quite well in hot, southwestern zones, and even though mine has a somewhat sunburned appearance – I’m not worried because this is normal. You see, roses that are grown in the low desert regions, don’t like the intense sun and heat that summer brings. As a result, the flowers become smaller and the petals literally burn in the sun and turn crispy. By July, you will likely not see any new roses appearing until October once the weather cools. The rose blooms themselves aren’t the only parts of the roses affected by the summer heat – the leaves can come away sunburned as well. When faced with brown crispy petals and leaves, you may be tempted to prune away the damaged leaves, but don’t. There are two reasons why you shouldn’t prune your roses in the summer. The first is that pruning will stimulate new growth that will be even more susceptible to sunburn damage. Second, the older branches and leaves will help to shade the growth underneath from the sun. I know that is very hard not to prune away the browning leaves, but once September comes around, you can get out your pruning shears and prune back your rose bushes by 1/3. This will remove the sun-damaged flowers and leaves, stimulating new growth. Before you start lamenting the less than stellar appearance of your summer roses and feel that it is easier to grow roses in other regions, you would be wrong. Oh, certainly we have to deal with our roses not looking their best in the summer. But, compare that with gardeners in other areas who have to deal with the dreaded Japanese beetle that shows up every summer and eats their roses. Or, how about those people who live in more humid climates and are having to deal with severe cases of blackspot or powdery mildew (white spots on the leaves). And lastly – we are fortunate to enjoy two separate blooming seasons for our roses. In fall, when many other gardeners are putting their roses to bed for the winter, ours are getting ready to bloom a second time that year. How about you? Do you grow roses in the desert? https://www.azplantlady.com/wp-content/uploads/2013/06/IMG_1702.jpg 480 640 arizonaplantlady@gmail.com http://www.azplantlady.com/wp-content/uploads/2018/10/favicon.png arizonaplantlady@gmail.com2017-07-23 21:00:002017-07-23 20:58:38Are Your Roses Feeling The Heat?